How deep in Big Oil's pocket are Oklahoma legislators when even Sam Brownback's Conservative Utopia of Kansas (A Subsidiary of Koch Industries) will admit it has a fracking earthquake problem, but Oklahoma is still in denial? Regulators in Kansas have imposed sharp restrictions on oil and gas activity in two southern counties in response to increased earthquakes in the area. The Kansas Corporation Commission (KCC) cited an "immediate danger" to public safety as the reason for limiting the pressure that can be used to inject wastewater into disposal wells and the volumes that can be injected. Meanwhile, Oklahoma's denial sounds a lot like Florida's state-ordered climate science denial. We can't talk about the cause because that would be a distraction from trying to deal with the effects, or something! The Oklahoma commission has also avoided explicitly linking earthquakes to disposal wells, saying getting embroiled in such a debate could bog down its response. But Kansas officials made a direct correlation. "The increased number of recorded earthquakes in Kansas coincides with an increase in the number of injection wells and the amounts of injected saltwater in Harper and Sumner counties," the order states. 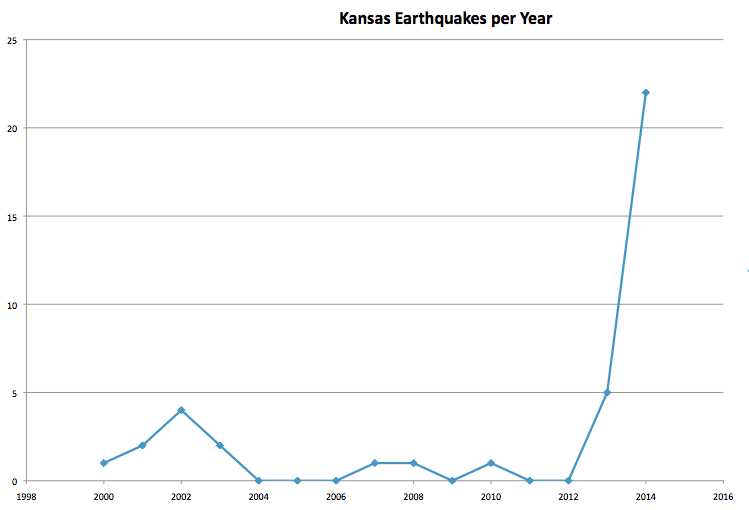 Kansas had 127 earthquakes last year, according to the commission order, and more than 50 this year by mid-March. From 1981 to 2010, Kansas had 31 quakes. This is an issue that states far from America's new FrackQuake Alley need to face up to. Here in Massachusetts, new fracked gas pipelines are being sold as the solution to all our problems. But in addition to the question of whether we even need new enormously expensive pipelines, do we really want to be supporting this kind of destructive drilling that also threatens public health in fracked communities? UPDATE 4/22/15: Oklahoma has ended its frackquake denial.